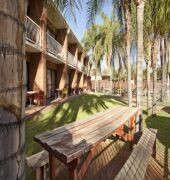 Toddy's, located close to the centre of Alice Springs, is a great place to stay. We have a range of comfortable, reasonably priced accommodation for the budget-conscious traveller - from spacious dormitories for backpackers to private motel rooms for families and groups. In addition we provide excellent facilities for all visitors to Alice Springs and Central Australia.